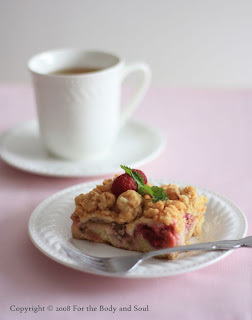 Skubaniec is a delicious Polish crumb cake with fruit and meringue. The first time I've had Skubaniec, was in Weranda Caffe, which is one of my favorite cafés in Poznań, Poland. Served with strawberry sauce, sprinkled with nuts and decorated with fresh lemon balm leaves, the cake tasted absolutely awesome!!! A few weeks after my last visit to Weranda Caffe, I found my mother’s recipe book by chance and, surprisingly, a recipe for Skubaniec cake in it. Since that time, I’ve been baking the cake constantly experimenting with different kinds of fruit. My favorite fruit combination so far has been raspberry and rhubarb, which I've made lately here, in Québec. In Poland, it was nearly impossible to buy fresh rhubarb and raspberries at the same time, so I've never tried such pairing before. I could have probably used frozen raspberries, but simply never thought about that. If like me, you've never had raspberry and rhubarb pairing before, try it, it's a delightful combination of flavors!!! As I said, you can use any type of fruit you want in this recipe. Both fresh and frozen fruit will work well. The original skubaniec recipe calls for cocoa in one part of the dough, but depending on the fruit I use, I often skip on it. I think in case of some fruit, the cake simply tastes better without it. In Poland I usually use Kasia margarine in this recipe; here I made the cake with soy margarine, but butter will work fine too. Use what's more convenient for you. 2. Wash the rhubarb, then trim and cut into 1.5 cm pieces. Place in a bowl and cover with half a cup of sugar. Set aside. 3. Combine the flour, baking powder and sugar. Using your fingertips, rub the margarine into the flour until the mixture resembles coarse breadcrumbs. Add egg yolks and form a dough. 4. Tear 2/3 of the dough into small pieces, scatter evenly at the bottom of a 13 x 9 inch (22 x 32 cm) baking pan. Reserve the rest of the dough, preferably in the fridge. 5. 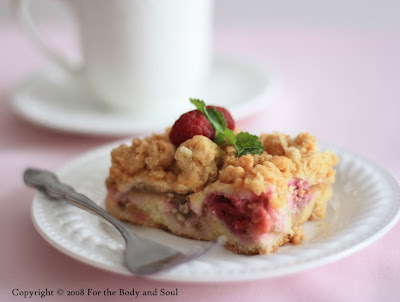 Strain the rhubarb, then sprinkle together with raspberries over the dough in the pan. 6. Using an electric mixer, beat the egg whites until stiff peaks form, gradually add the sugar and potato starch and continue beating until glossy. Spread the meringue over the rhubarb and raspberry mixture, then scatter with pieces of the remaining dough. 7. Bake for about one hour. Oh yeah that's one of my favourite cakes as well. But usually I don't use meringue. Just because I don't like it. And I prefer salted butter instead of margarine.